Eating healthy – very healthy – doesn’t always mean breaking the bank on every grocery trip. With the right shopping strategies it becomes very easy to save money while eating nutrient-dense, whole foods. I’ve shared 11 of my personal strategies for saving money while eating healthy. And I should know: I’ve bought my own healthy food since I was 17 and have made the transition from “broke college student” to “entrepreneur with student loans”. 1. You SAVE money in both the short and long term. Short term – you save money by not buying cookies, chips, and soda. I went to the grocery store with my first paycheck as a teen and did the math very quickly. I could buy a pack of my favorite cookies for $4.50, or I could buy 3-4 pounds of apples for $4.50. The cookies will last me a few days, the apples a week. Honestly, the amount of money you’ll save by skipping junk food and fast food will significantly offset the cost of fitness coaching or a gym membership. Long term – you save money on your medical bills when you’re in better health. Many of my clients have an initial goal of getting off of their expensive medications. Cholesterol, high blood pressure, and type II diabetes medications top the list. A 2012 article published in the Journal of Health Economics reported that obese men spend, on average, an extra $1,152 per year in medical spending. This was especially true for hospitalizations and prescription drugs. 2. Skip the health foods store, unless buying produce, meat, or seafood. The days of health foods stores being the only game in town are over. Every major chain stocks organic, gluten-free, sugar-free, non-GMO, you-name-it. The rules have changed. Chances are, you can buy your gluten-free cookies for less somewhere else. Or again, ditch the empty calories and high price tag and trade in for extra fruits and veggies! I will say though, the produce found (even conventional) at most health food stores surpasses that of major chain stores in most cases. It’s my personal opinion, but I find that it is fresher, tastes better, and keeps for longer. 3. Only buy organic produce when it’s necessary. Here’s a simple rule: if you have to peel it (bananas, oranges), you don’t have to buy it organic. The organic version frequently does have more nutrients, however. If it’s an exposed fruit (apples, berries), the conventional version will have a significantly higher amount of pesticides. I’ll never buy conventional grapes again. The pesticide count is staggering. I can purchase 8 free-range, antibiotic-free, non-GMO fed chicken breasts at my local bulk grocery store for $15-18 dollars. Best of all, they don’t have that slimy residue that other chicken breasts have. I also can pick up 2 dozen omega 3, free-range eggs for $3.50, 4 pounds of rolled oats for $4-$5, whole grain bread for $2.50-$3, almond milk for $3.50, baby carrots for $1/lb, organic apples for $1.50/lb, and tons of flash frozen veggies. 5. Buy flash frozen veggies and fruits – in bulk. Flash freezing essentially locks in nutrients when food is the freshest. It’s also cost-effective and lets you eat your favorite vegetables year round. For smoothies and post-workout shakes (link), buying frozen wild blueberries ($7 for 3lbs bulk) is much less expensive than paying $3-4 dollars a mere pint. I throw blueberries into my oatmeal, shakes, and onto spinach salads year-round. 6. Cut out the middle man and buy supplements online – in bulk. Cut out the middle man and purchase your protein online. For example, Prograde sells 1 bottle for $47.95 but 6 bottles of high-quality for $38.33 each. Click here to purchase Prograde protein & supplements from Devin Gray Fitness. 7. Buy generics and shop by price per lb or per unit, not sticker price. These apply to shopping anywhere, but especially healthy foods. I worked at a certain national health food store through college and their generic line is fantastic. I also learned how to save money there in the process. I can buy a pound of whole grain pasta for $1 and organic pasta sauce for $2-$3. I worked there through college and learned very quickly how to save money there. 8. Buy fresh produce seasonally. Out of season produce is typically shipped from warmer climates across the world. Shipping costs are significantly higher and so the price of the food goes up as well. This is another reason why flash frozen fruits and vegetables are a great option. 9. Check online, on deal of the day sites, and in coupon books for deals. Example – I add flax seeds and chia seeds to oatmeal, yogurt, salads, and my post-workout shakes. I eat a ton of them. Every so often there will be a sale on Groupon or Living Social for multiple packages of flax and chia seeds. There are also frequent deals for shipped food, such as steaks or seafood, and for local healthy restaurants and health food stores. Finally, my membership at the local bulk store includes a monthly coupon book. While the things I buy are rarely on sale, I’ll occasionally find a great deal on frozen veggies or Greek yogurt. I’ll confess – I hate cooking. And I hate washing dishes even more. So when I cook, I go big. I cook everything all at once and throw it in tupperware for the week. This saves me hours of time each week, as I simply grab what’s been cooked and reheat. It also makes sure that I use all of the bulk groceries that I just bought. 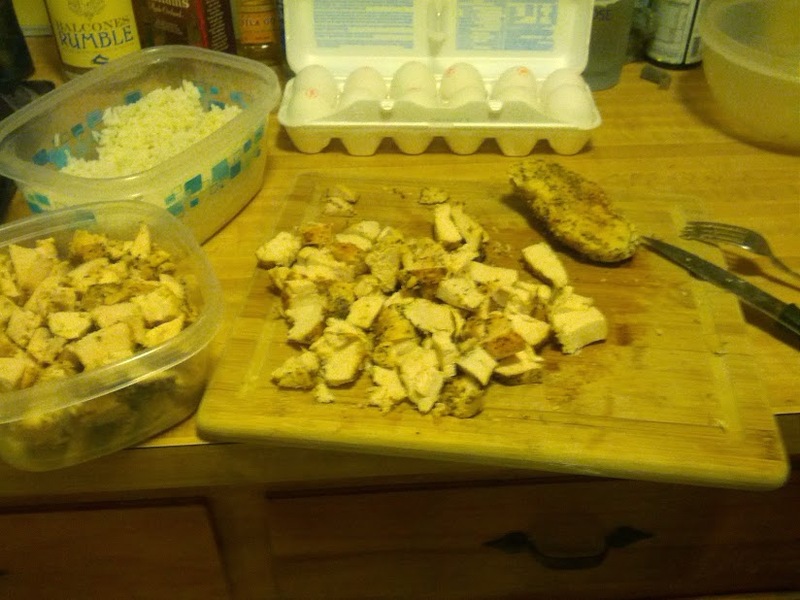 A typical Sunday night in my kitchen – cubed chicken breasts, brown rice, steamed broccoli and carrots, and hard boiled eggs. If I have a certain dish planned, I’ll add the specific seasons or sauces as I’m reheating. For example, I cook very plain chicken breasts (sea salt, pepper, garlic powder, cayenne), much to my girlfriend’s dismay. This makes it simple to make a new dish, such as marinated chicken burritos. 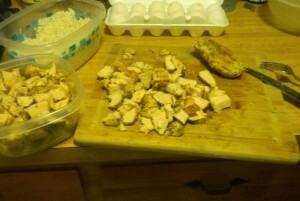 I simply marinate / reheat the pre-cooked and cubed chicken in salsa verde and it’s a brand new meal. I’m pretty frugal. I often joke that the best thing about being a cadet in college was not having to buy new clothes for 4 years. 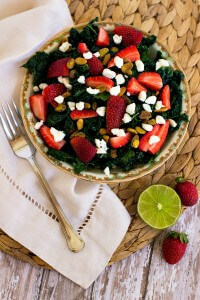 Now, in a perfect world, you should eat a wide variety of fruits, vegetables, proteins, and fats. Eat the rainbow, as they say. But if you’re on a tight budget, as I can attest, knowing a few tried, true, and cheap recipes goes a long way. I also keep a constant stock of healthy condiments, salsas, and limes for flavor. I’ve stayed lean, healthy, and well-fed for the past 3 years on a relatively constant monthly grocery bill. This also means that when you do go out for a special dinner, you enjoy what you order that much more. For more information on the annual costs of obesity, Reuters ran a great piece in 2012 here. To purchase Prograde protein powder at a bulk discount from Devin Gray Fitness, click here.